Flash Cards Video - Got Skills? NOTE: You should familiarize yourself with the anatomy of the heart and have a good understanding of the flow of blood through the heart before reading this page. You may want to go to the "Anatomy of the Heart" page to review (link is provided above). The circulatory system functions to circulate blood through the body. The blood carries vital nutrients, oxygen and hormones to the cells, and also picks up unwanted toxins, waste and carbon dioxide from the cells. The circulatory system circulates blood around two loops. - The function of the heart is to pump the blood around the body. 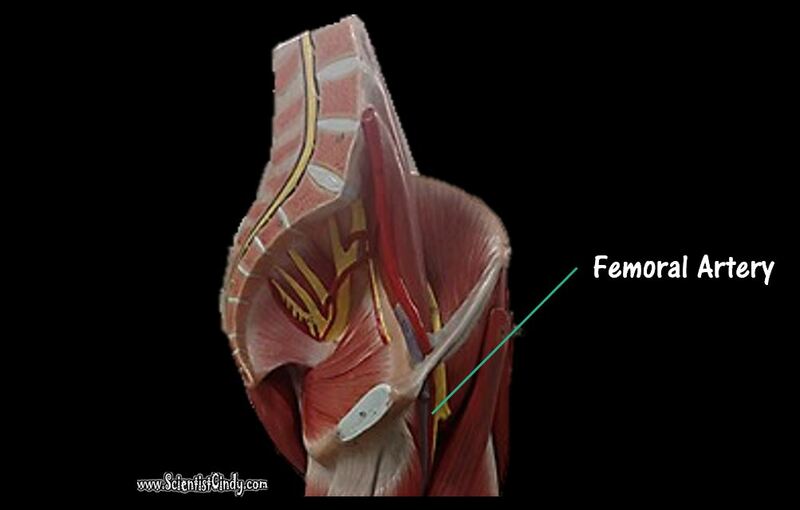 It does this by creating a pressure gradient that forces the movement of the blood. - The function of the blood is to deliver oxygen and nutrients to the cells of the body and to take away the unwanted waste products and carbon dioxide from the cells. - The function of the blood vessels is to provide the network of passage ways that the blood can travel in. In short, the blood vessels allow the blood to travel through the body. The circulatory system has specialized vessels that transport blood around the body. ​These vessels fall into one of two broad categories; arteries and veins. ARTERIES = Arteries are the blood vessels that are carrying blood AWAY FROM the heart. The arteries have high pressure. VEINS = Veins are the blood vessels that are carrying blood TOWARDS the heart. ​The veins have low pressure since they are further away from the heart. Veins have one-way valves that prevent the blood from flowing backward. 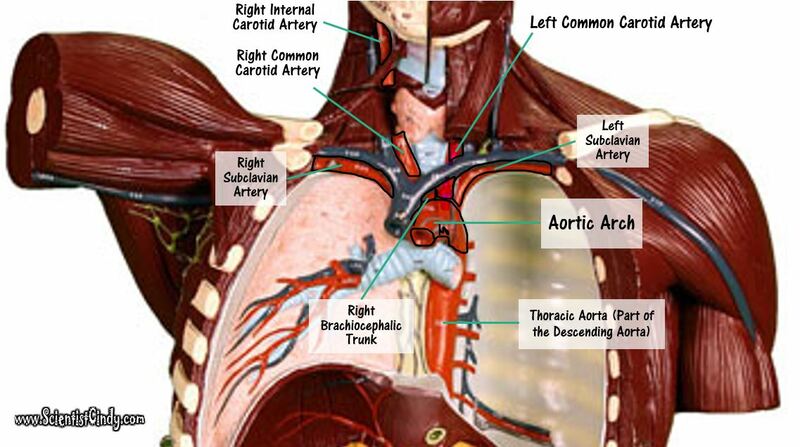 The aortic arch functions to send blood to the upper body via 3 branches. 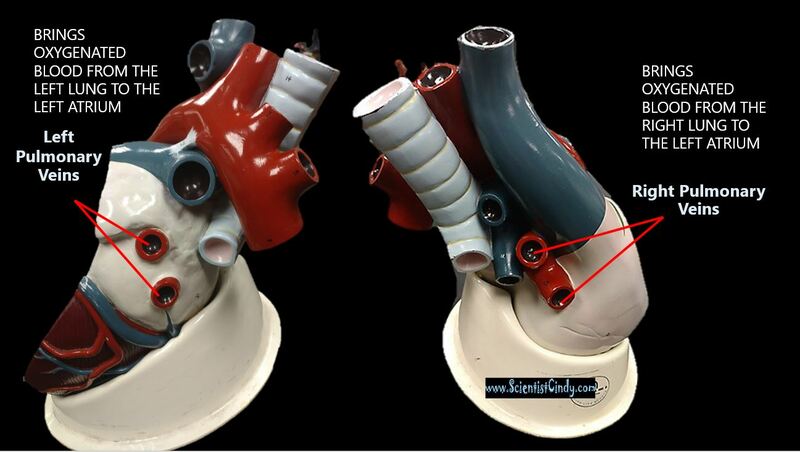 ​3) the left subclavian artery. The first branch is the brachiocephalic trunk (brachiocephalic artery). 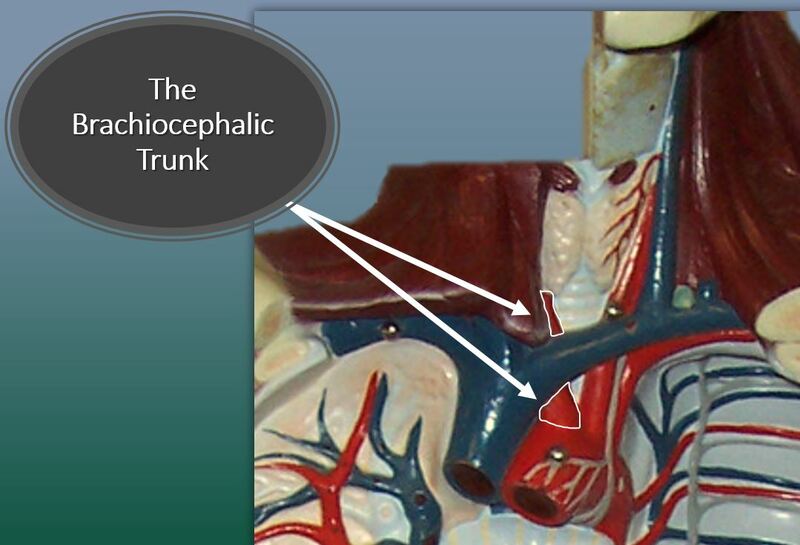 The brachiocephalic trunk sends blood to the right arm, and the head and neck. The brachiocephalic trunk branches off to form the right subclavian artery and the right common carotid artery. 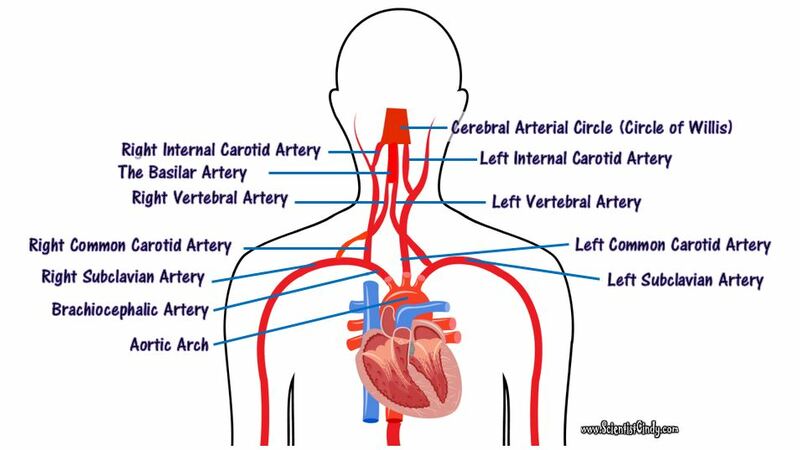 The right subclavian artery supplies blood to the right arm and the right common carotid artery supplies blood to the right side of the head and neck. 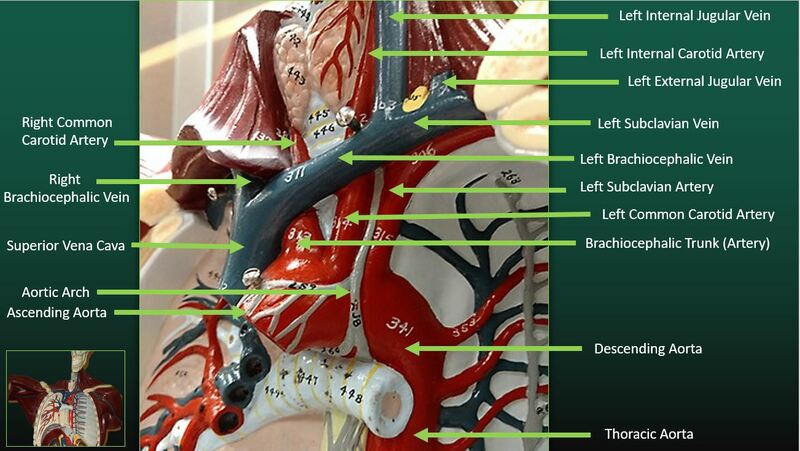 The second branch is the left common carotid artery and it supplies blood to the left side of the head and neck. The third branch is the left subclavian artery and it supplies blood to the left arm. The ascending aorta brings oxygenated blood from the left ventricle (the blood passes through the aortic semilunar valve) to the portions of the aorta called the AORTIC ARCH and the DESCENDING AORTA. The aortic arch contains branches that send blood to the upper body. The descending aorta sends blood to the lower regions of the body. The heart itself needs a supply of blood. 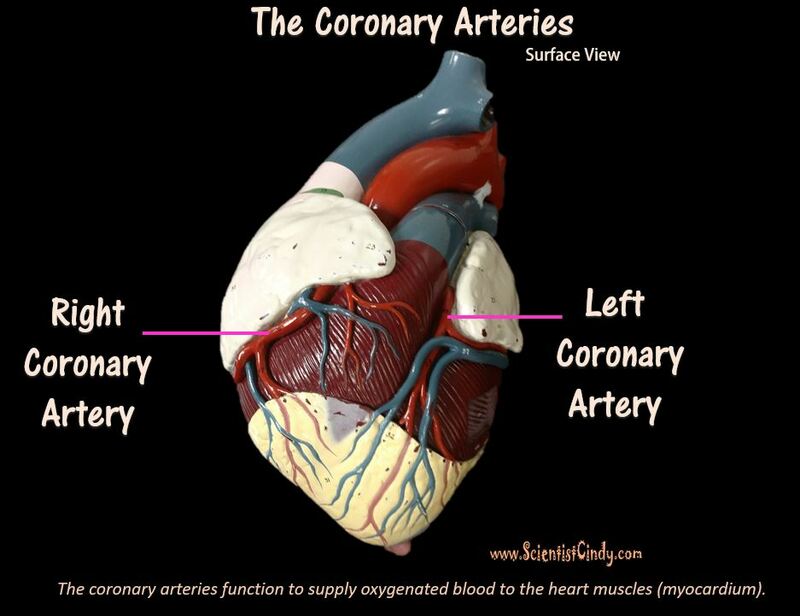 There are two arteries that begin at the base of the aorta called the right and left coronary arteries. 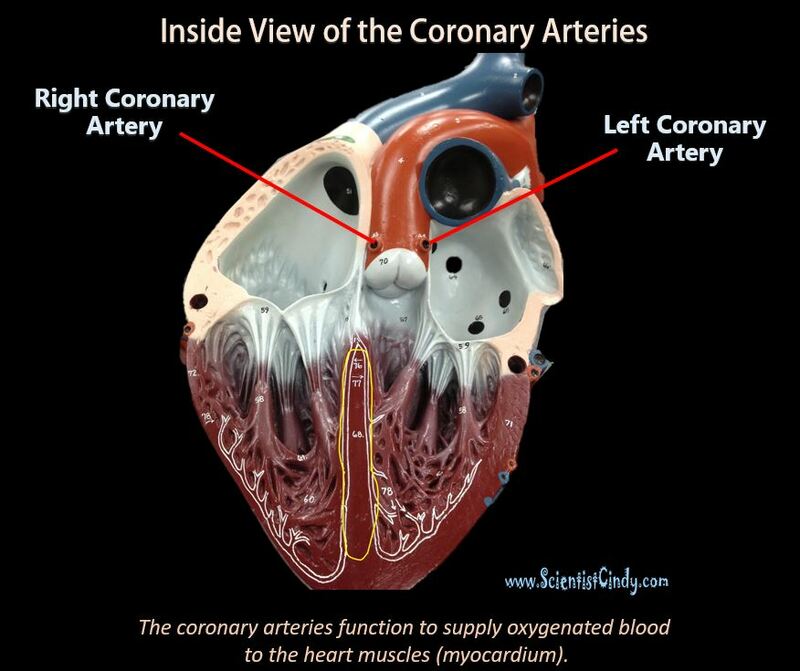 The right coronary artery supplies oxygenated blood to the cardiac muscles on the right side of the heart and the left coronary artery supplies oxygenated blood to the cardiac muscles on the left side of the heart. The right and left coronary arteries begin at the base of the aorta (the ascending aorta) and travel to the surface of the heart. 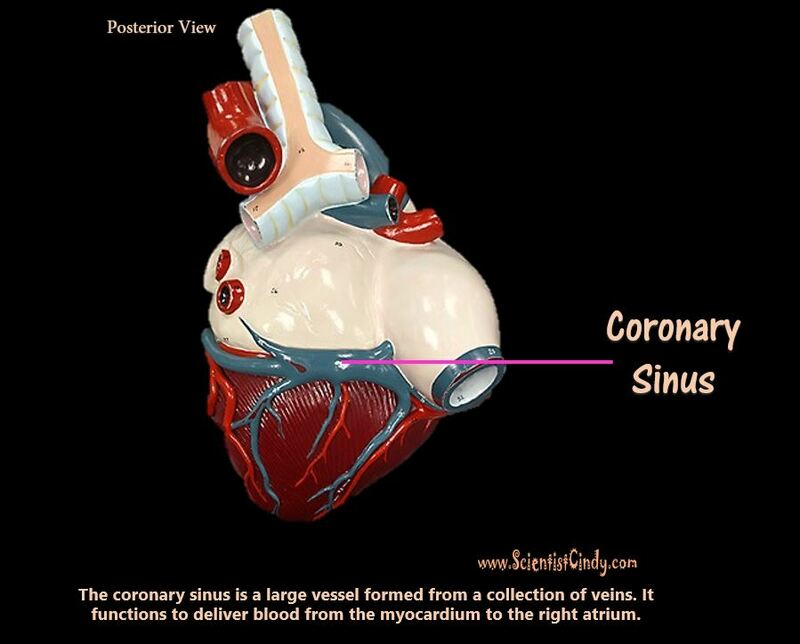 The right coronary artery runs along the surface of the right atrium. The left coronary artery reaches the surface of the heart and quickly branches off to form two different arteries (see next image). 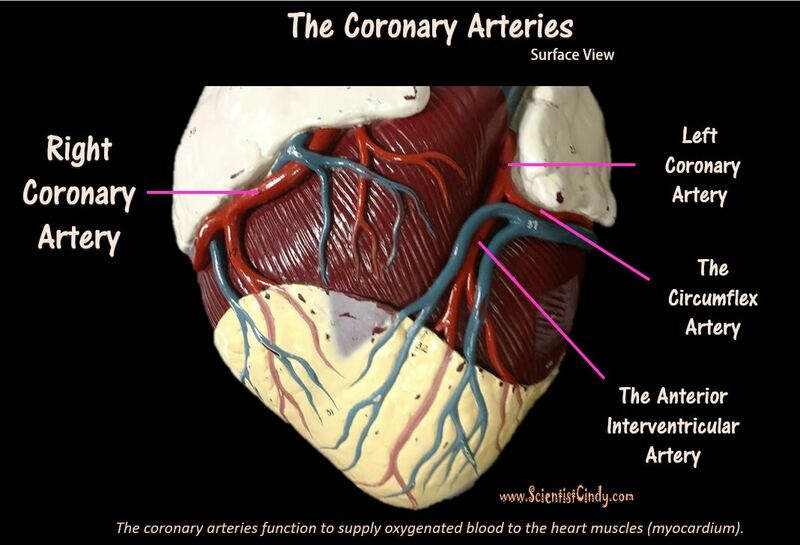 The left coronary artery branches off to form the circumflex artery and the anterior interventricular artery. The circumflex artery circles around the inferior border of the left atrium. The anterior interventricular artery continues downward lying in between the right and left ventricles. 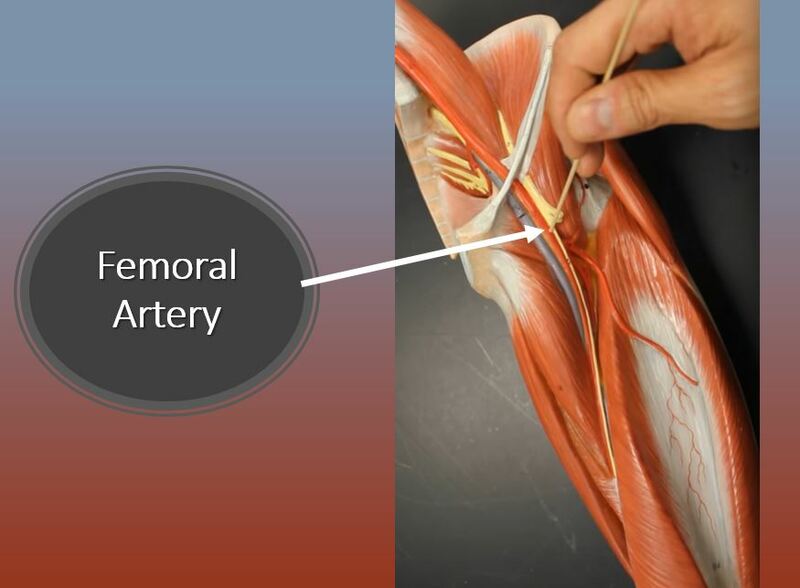 The descending aorta supplies blood to the lower body and has branches that travel to the abdomen, pelvis, perineum and the lower limbs. 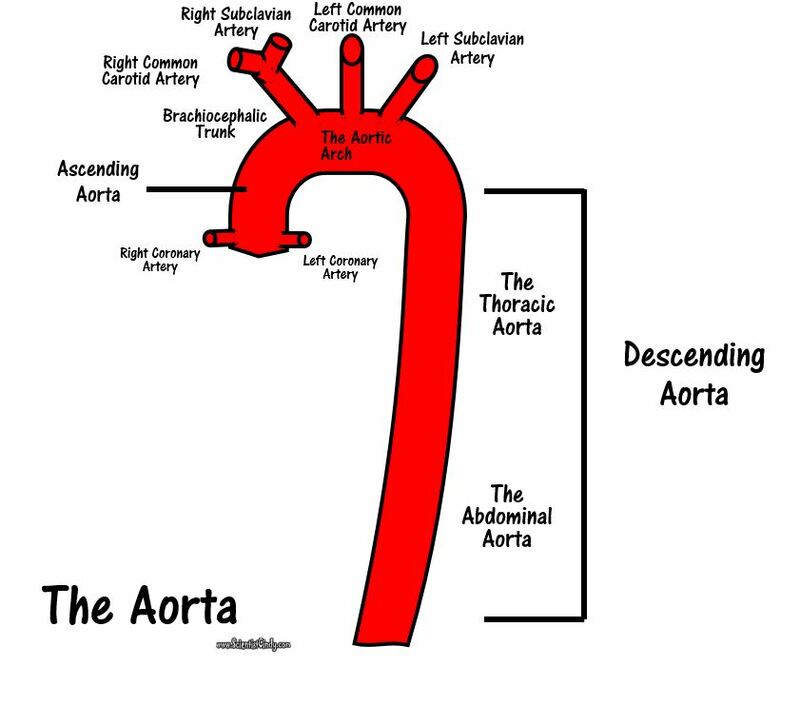 The descending aorta is the portion of the aorta that comes just after the aortic arch. It turns downward and descends to deliver oxygenated blood to the lower portions of the body. The portion of the descending aorta that goes through the thoracic cavity is the THORACIC AORTA. ​ The portion of the descending aorta that travels into the abdominal cavity is the ABDOMINAL AORTA. 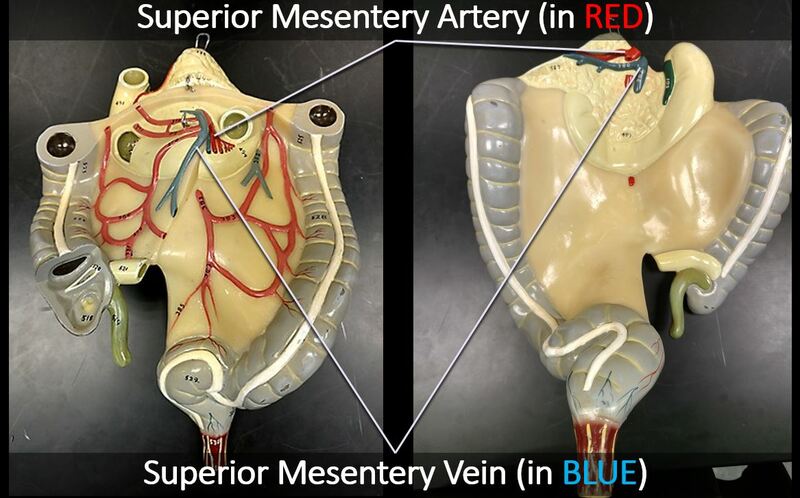 The next largest artery you see in the heart is colored BLUE because it is carrying deoxygenated blood from the right ventricle to the lungs. 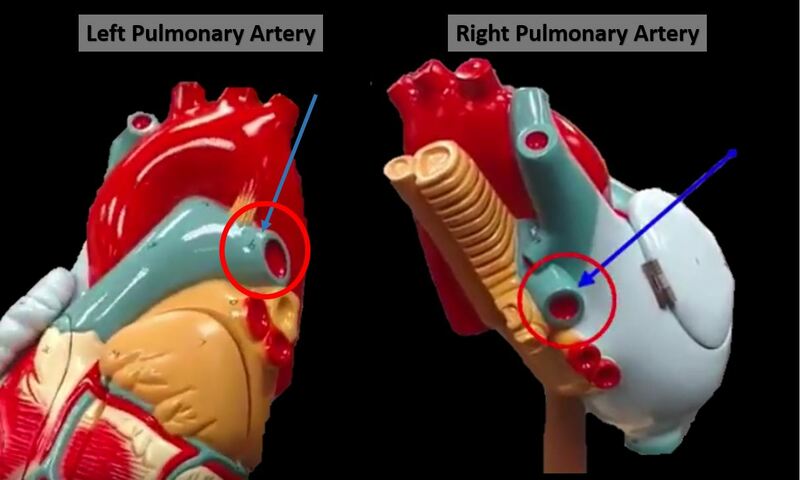 This artery is called the pulmonary trunk. 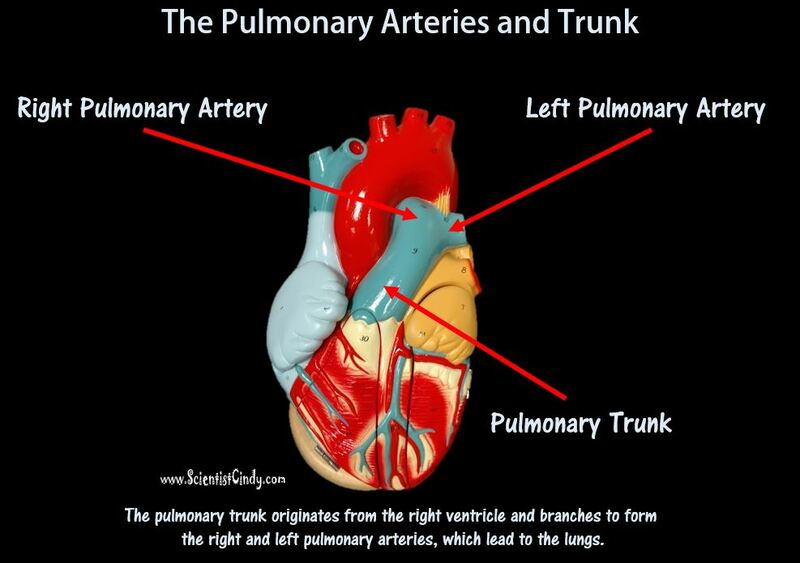 The pulmonary trunk branches off to form the right and left pulmonary arteries. 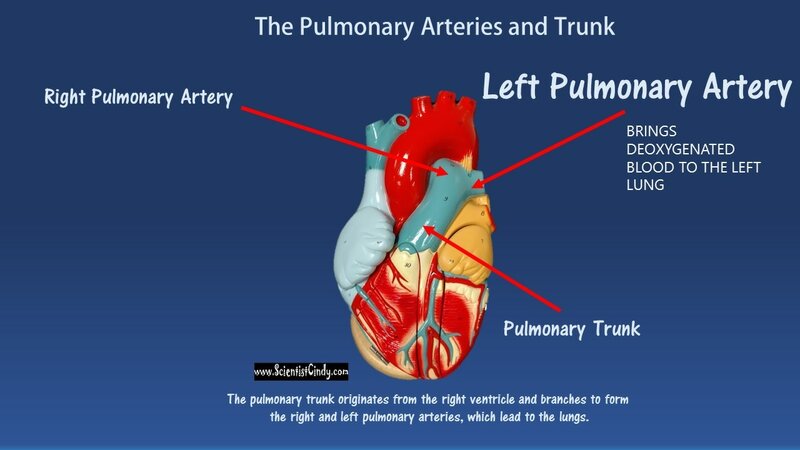 The right pulmonary artery carries the blood to the right lung and the left pulmonary artery carries blood to the left lung. 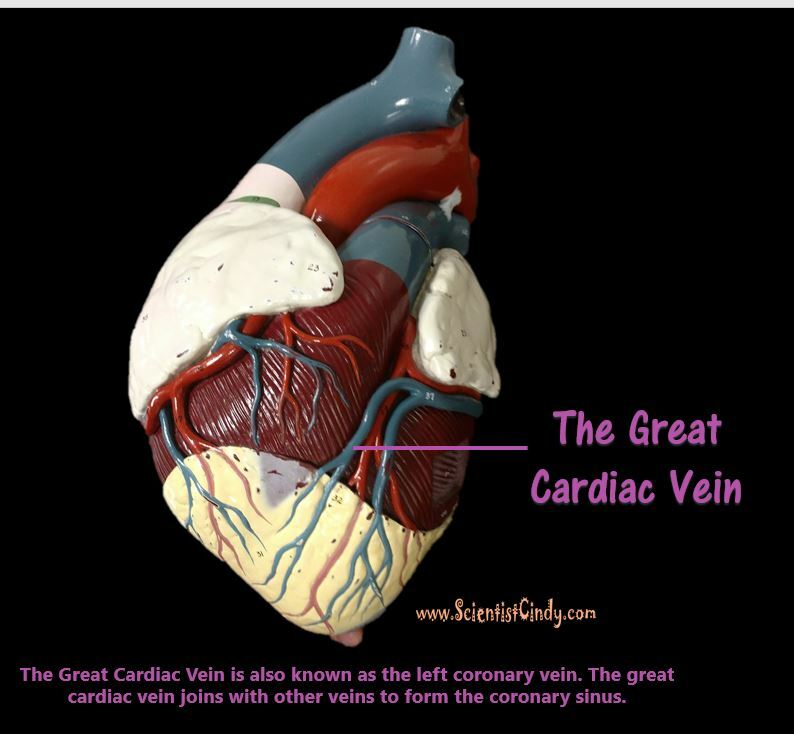 The largest veins of the body are the superior and inferior vena cava. The superior vena cava brings deoxygenated blood from the upper body to the right atrium. 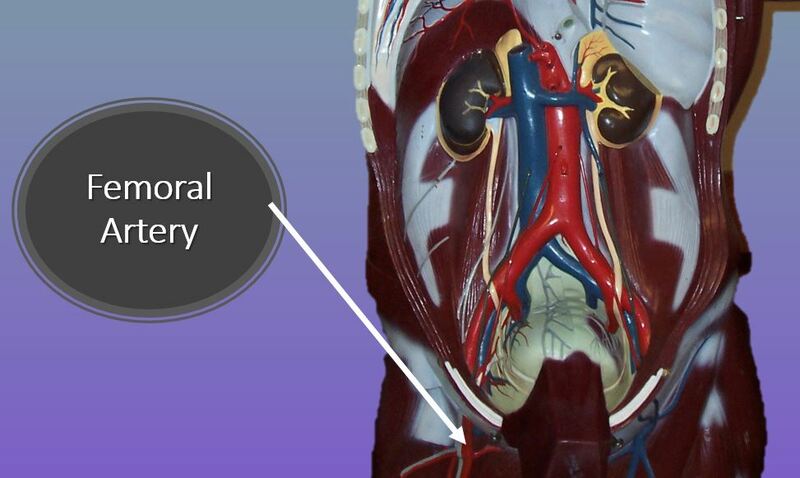 The inferior vena cava brings deoxygenated blood from the lower body to the right atrium. 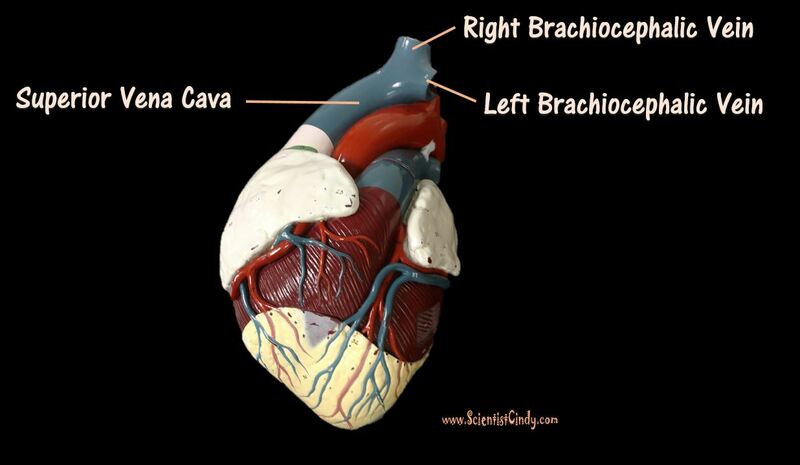 The right and left brachiocephalic veins come together to form the superior vena cava. 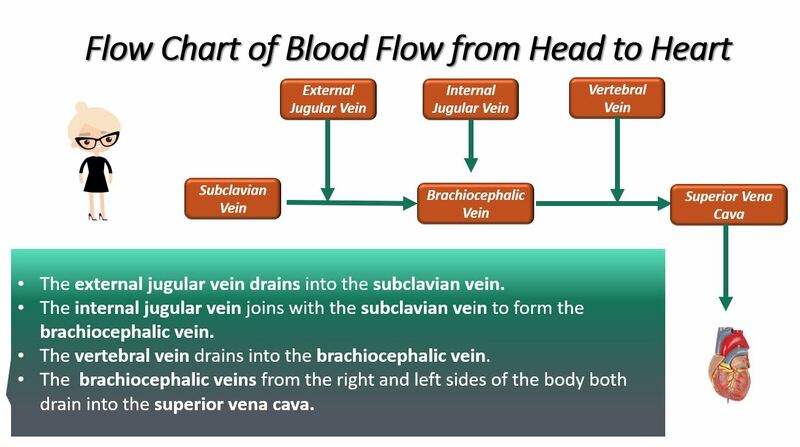 The right brachiocephalic vein brings deoxygenated blood from the right side of the head and neck and the right arm, to the superior vena cava. The left brachiocephalic vein brings deoxygenated blood from the left side of the head and neck and the left arm, to the superior vena cava. 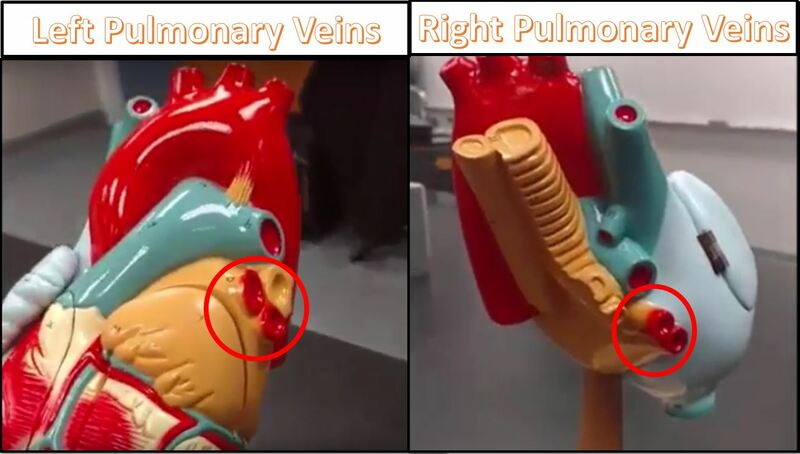 Oxygenated blood coming from the lungs returns to the heart through the right and left pulmonary veins. 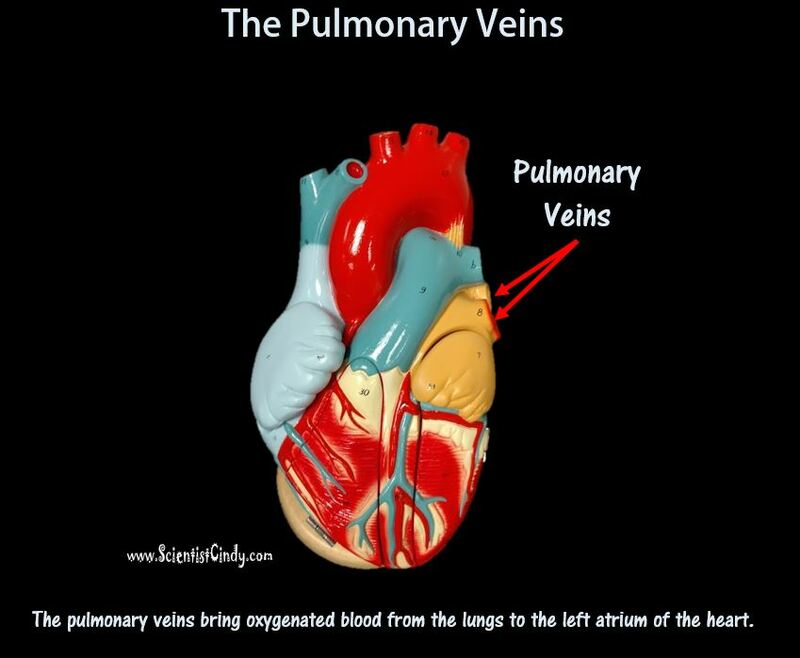 The right pulmonary veins bring oxygenated blood from the right lung to the left atrium of the heart. 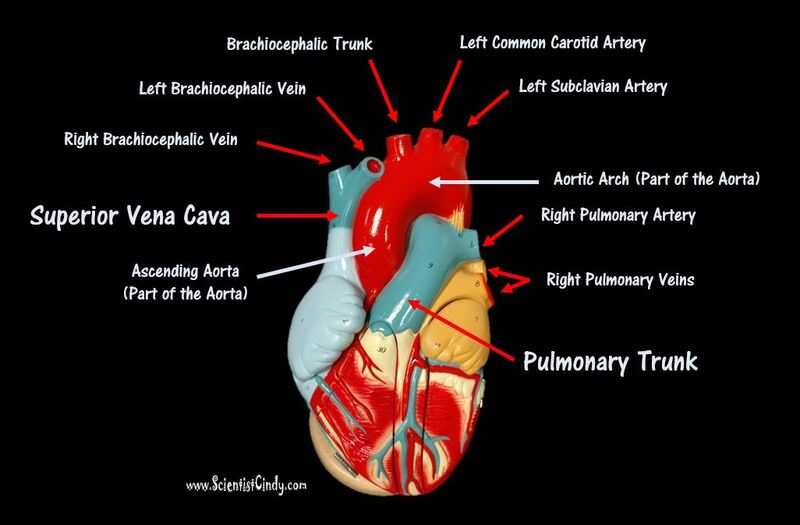 The left pulmonary veins bring oxygenated blood from the left lung to the left atrium of the heart. The circulatory system circulates blood around two major loops. Your brain uses a lot of blood for its size. About 20% of your blood supply is directed toward your brain to keep you reading this page! Let's look at the basics of how the blood gets there. Oxygenated blood from the heart travels through he aorta. The aorta contains 3 branches; the brachiocephalic trunk (or artery), the left common carotid artery, and the left subclavian artery. All 3 of these branches carry blood from the aorta to the brain, head and neck. Oxygenated blood from the left ventricle leave the heart through the aorta. This blood travels through the ascending aorta to the aortic arch. 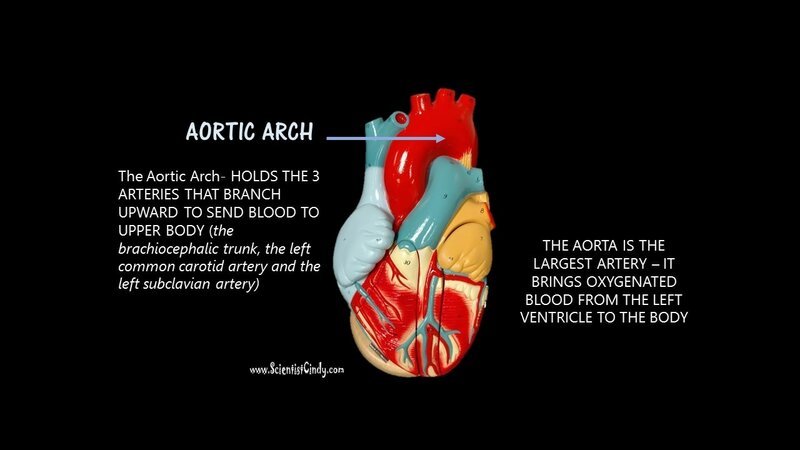 The aortic arch has 3 branches that send blood to the upper portions of the body. Each of the 3 branches off the aorta have pathways that lead to the brain (the arterial cerebral circle). The first branch off of the aortic arch is the brachiocephalic trunk. The brachiocephalic trunk (or artery) branches off to form the right subclavian artery and the right common carotid artery. The right subclavian artery brings blood to the right vertebral artery which joins with the basilar artery which lies at the base of the brain. 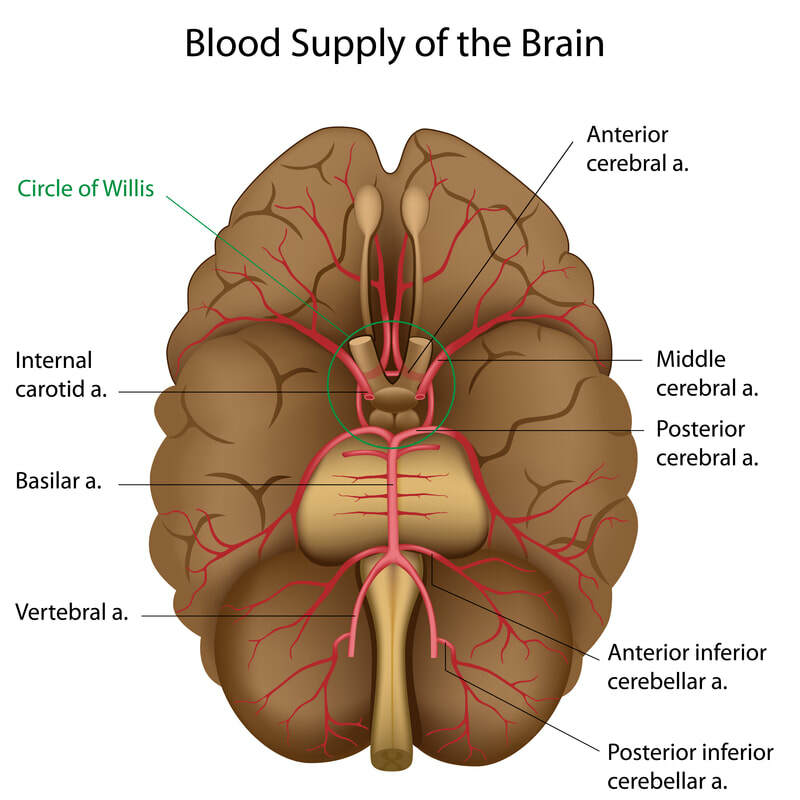 The basilar artery connects to the cerebral arterial circle (a.k.a. the circle of Willis) which delivers oxygenated blood to the brain. The brachiocephalic trunk (the first branch off of the aortic arch) has another branch called the right common carotid artery. 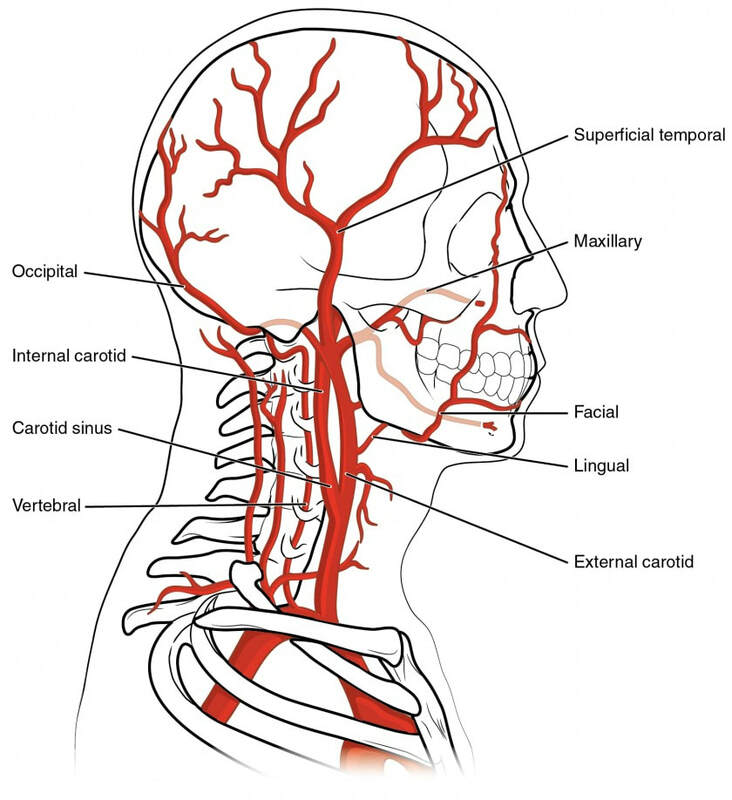 The right common carotid artery branches to form the right internal carotid artery which leads directly to the cerebral arterial circle (a.k.a. the circle of Willis) of the brain. The second branch coming off of the aortic arch is the left common carotid artery. 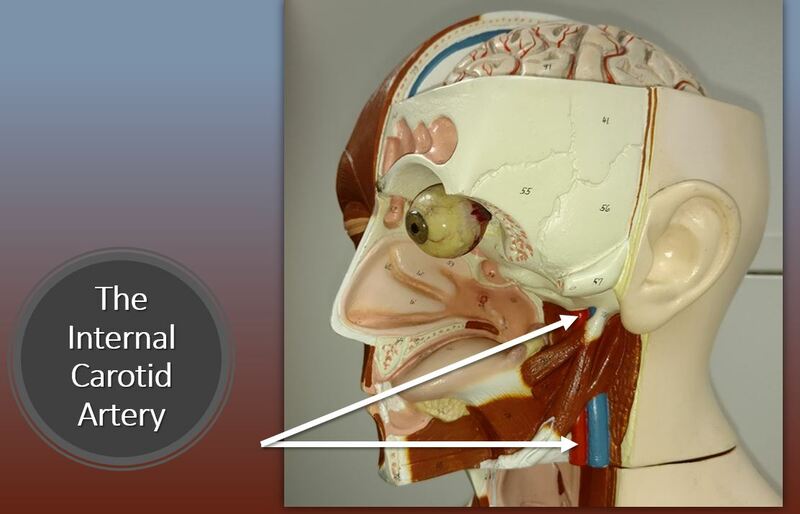 The left common carotid artery ascends to form the internal carotid artery which leads directly to the cerebral arterial circle (a.k.a. the circle of Willis) of the brain. The third branch coming off of the aortic arch is the left subclavian artery. The left subclavian artery brings blood to the right vertebral artery which joins with the basilar artery which lies at the base of the brain. 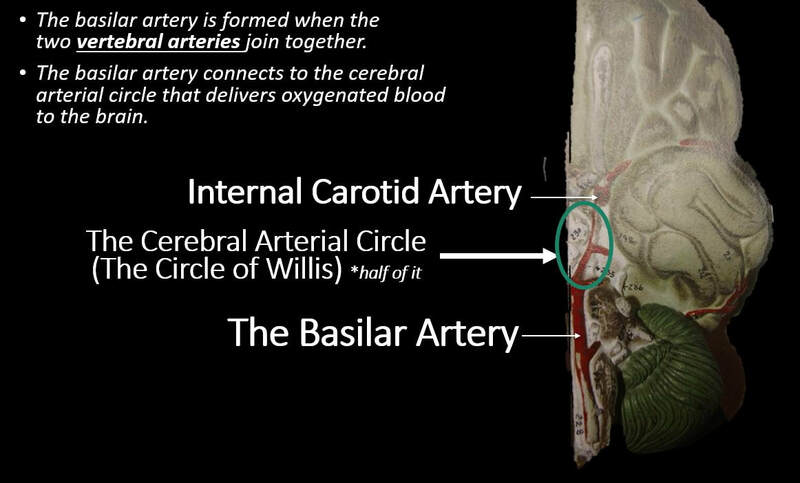 The basilar artery connects to the cerebral arterial circle (a.k.a. 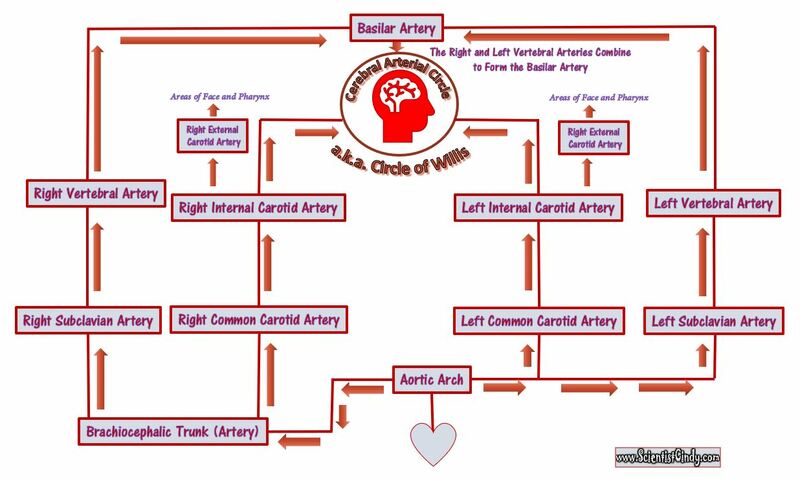 the circle of Willis) which delivers oxygenated blood to the brain. 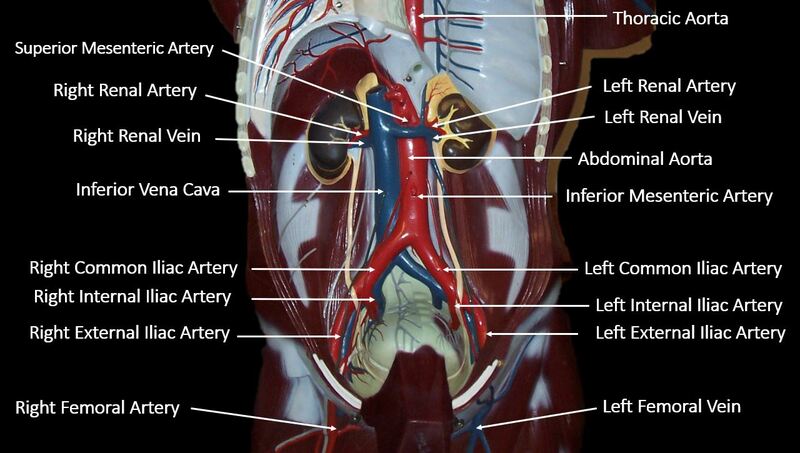 The Veins from the Brain, Head and Neck Areas to the Heart. What goes up, must come down. Deoxygenated blood from the brain, head and neck to the heart. There are 6 major pathways that this blood from the brain, head and neck travels to the heart. 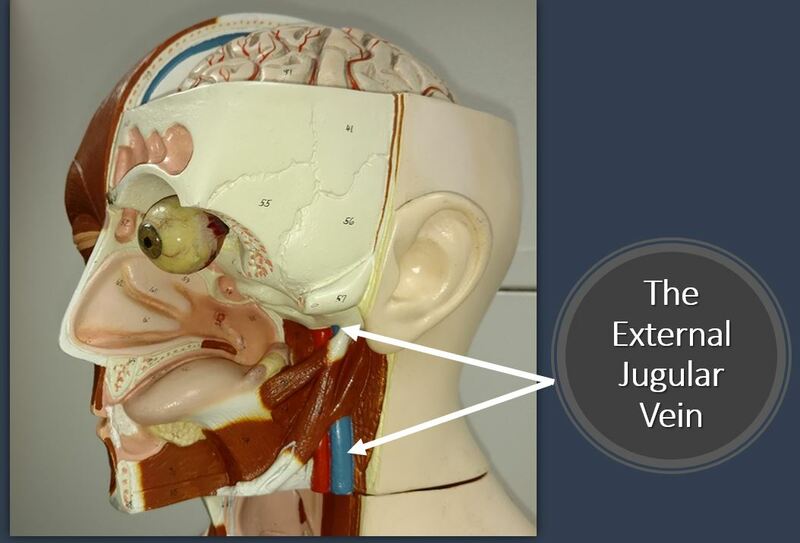 These pathways begin at the right and left external jugular veins, the right and left vertebral veins and the right and left internal jugular veins. 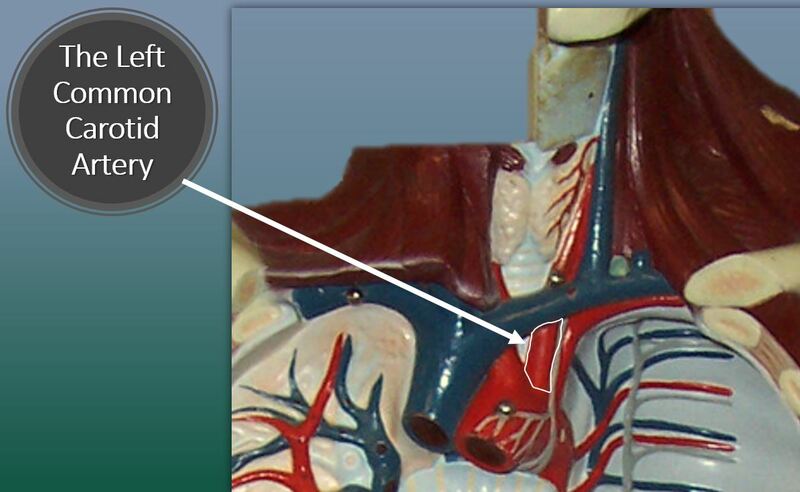 The right and left external jugular veins travel to the right and left subclavian vein. 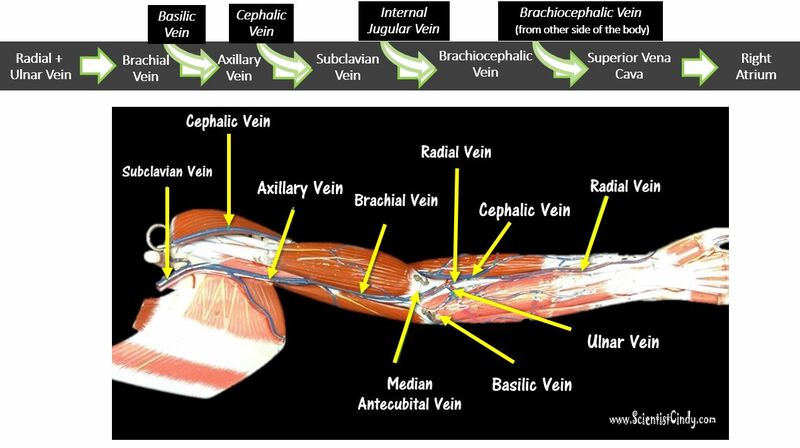 From there the blood travels through the right and left brachiocephalic veins to the superior vena cava. 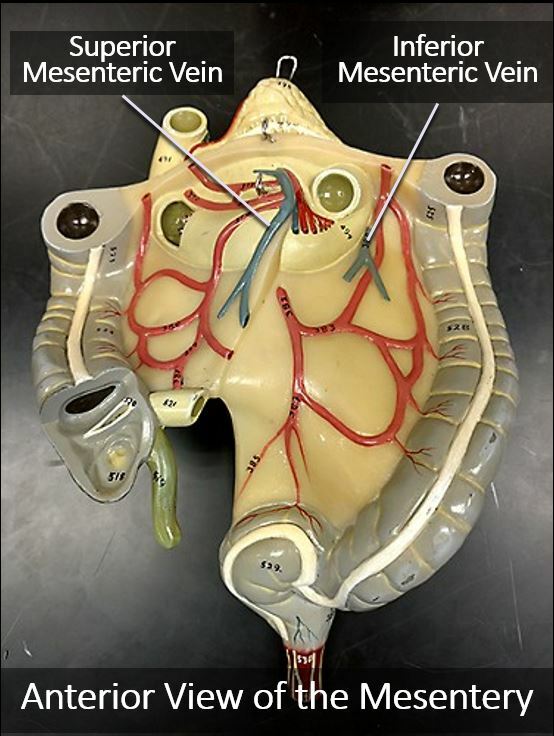 The right and left vertebral veins connect to the right and left brachiocephalic veins which then travels to the superior vena cava. 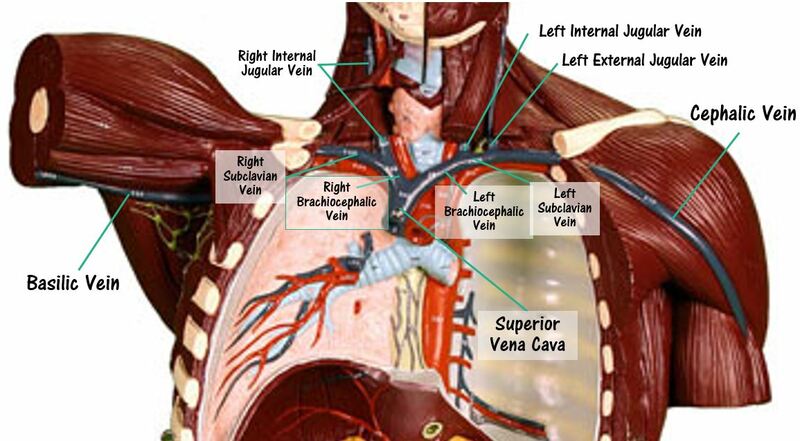 The right and left internal jugular veins also travel to the brachiocephalic veins which connects with the superior vena cava. After the deoxygenated blood reaches the superior vena cava, it flows into the right atrium of the heart. Oxygenated blood travels down the arms as well. Oxygenated blood leaves the left ventricle of the heart through the aortic semilunar valve and enters the ascending aorta. The blood travels superiorly to the aortic arch. Blood destined for the right arm enters the right brachiocephalic trunk (the first branch of the aortic arch) and then enters the right subclavian artery. 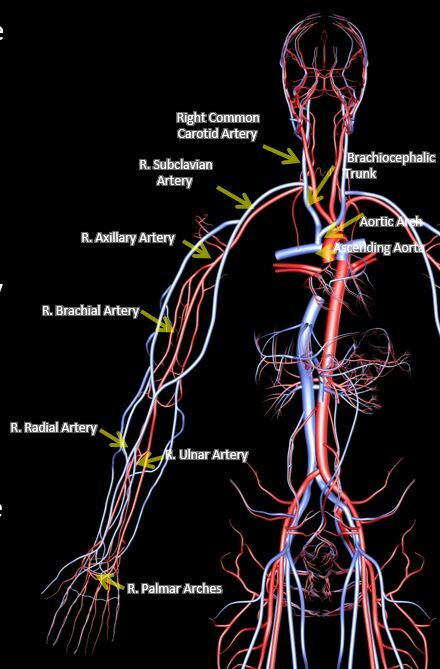 Blood destined for the left arm travels though the 2nd branch of the aortic arch, which is the left subclavian artery. 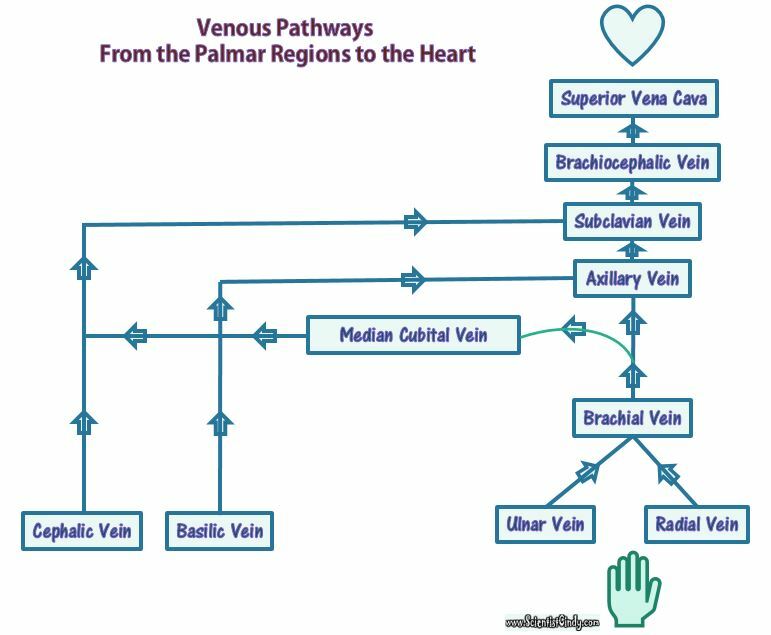 From this point, the arterial pathways from the right and left subclavian arteries to the palms (palmar arches) are identical. The subclavian artery continues to travel laterally toward the shoulder, then turns inferiorly at the axillary region (area of the arm pit) to become the axillary artery. 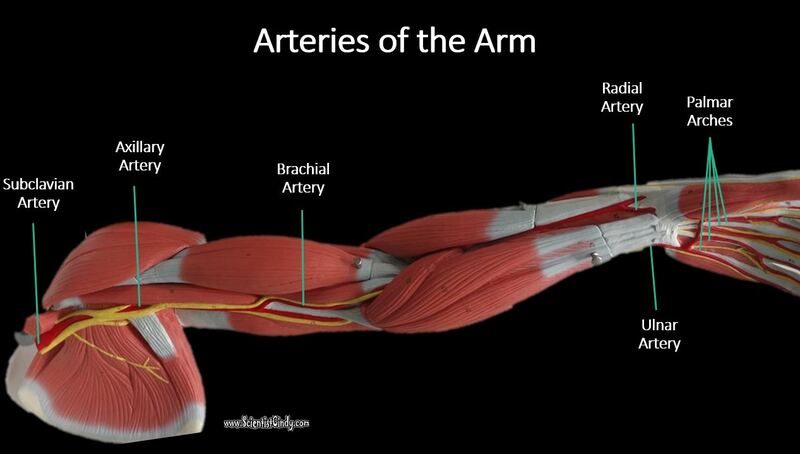 The axillary artery then becomes the brachial artery at the brachial region (the region of the upper arm). The brachial artery branches off inferiorly to form the radial and ulnar arteries. 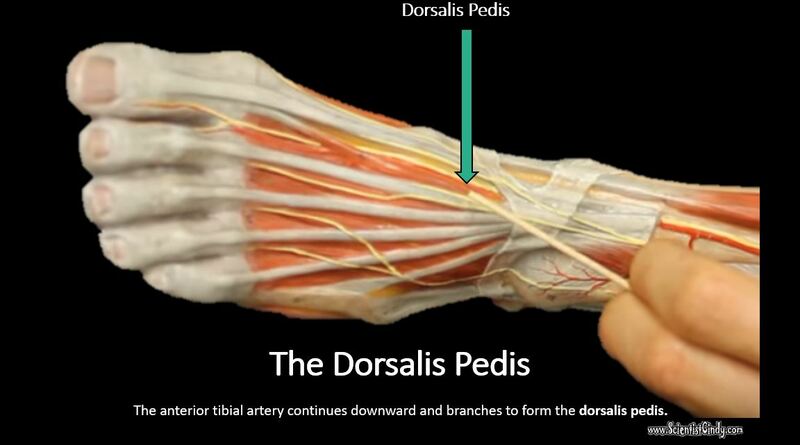 The radial and ulnar arteries travel downward through the forearm (antebrachial region) and then rejoin at the palmar region (region of the palm of the hend), forming the palmar arches. 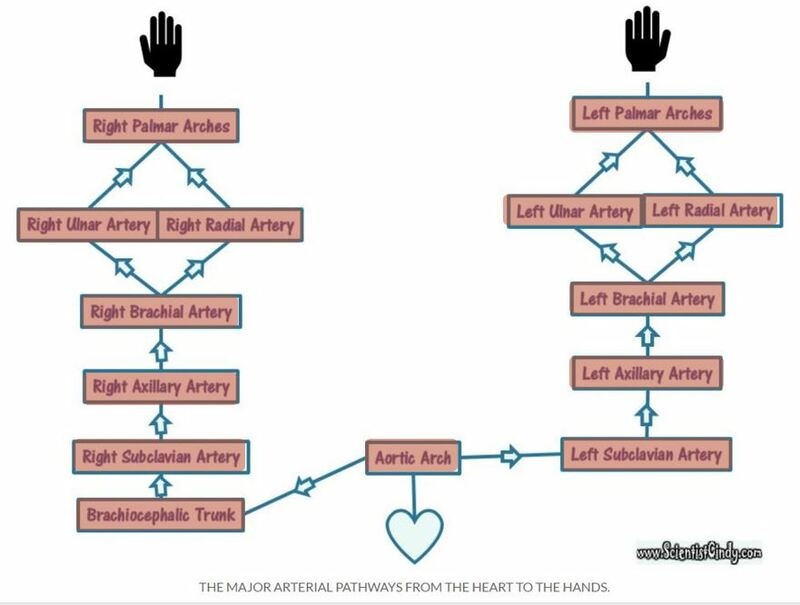 THE MAJOR ARTERIAL PATHWAYS FROM THE HEART TO THE HANDS. Once the blood has circulated through the tissues of the arm, it will become "deoxygenated" and will need to return to the heart to get another "push" before picking up more oxygen at the lungs. There are few pathways that this blood return to the heart from the hands. The deep veins mirror the pathway of the arteries and may be a bit easier to learn, given this fact. 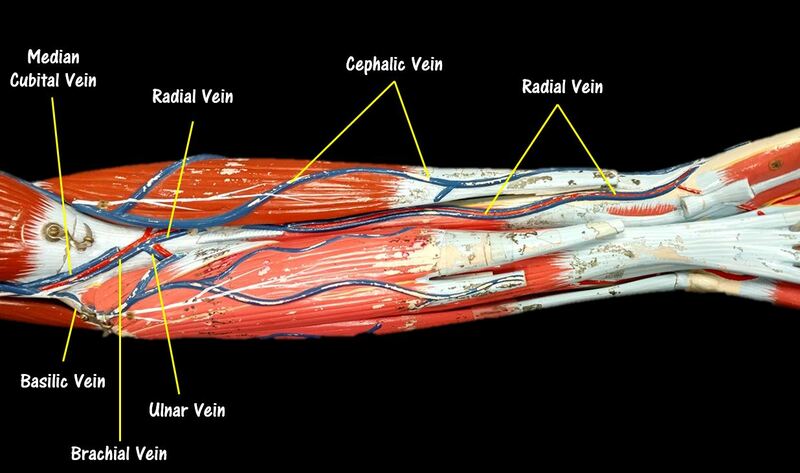 The deep pathway begins as the ulnar and radial veins collect deoxygenated blood from the hands. The ulnar and radial veins travel superiorly through the lower arm, then merge to form the brachial vein in the brachial region (area of the upper arm). 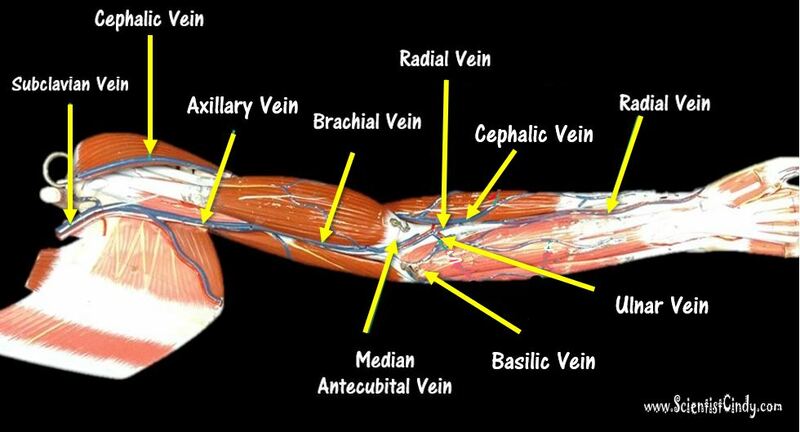 The blood travels superiorly through the brachial vein which turns into axillary vein at the axillary region (area of the arm pit). This vein becomes the subclavian vein as it passes the clavicle bone. 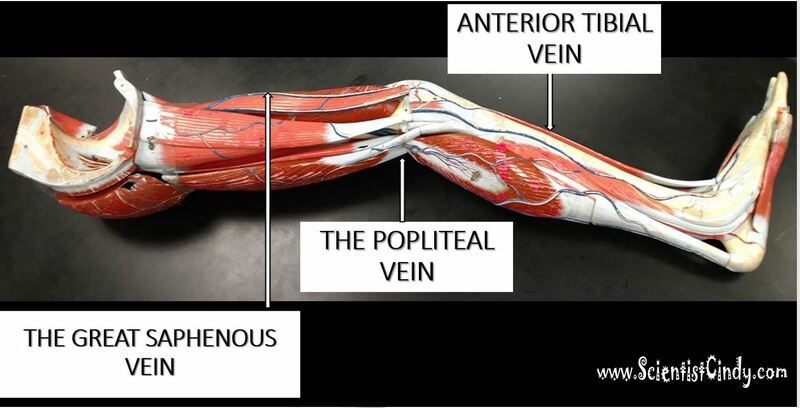 Deoxygenated blood from the hand can also travel superiorly through the cephalic vein which runs the length of the arm on the radial side (the side of the thumb) and directly connects superiorly with the subclavian vein. A similar pathway exists on the ulnar side of the arm in which deoxygenated blood from the hand travels through the basilic vein. The basilic vein runs the length of the arm on the ulnar side (the side of the pinky) and connects superiorly to the axillary vein, which connects with the subclavian vein. 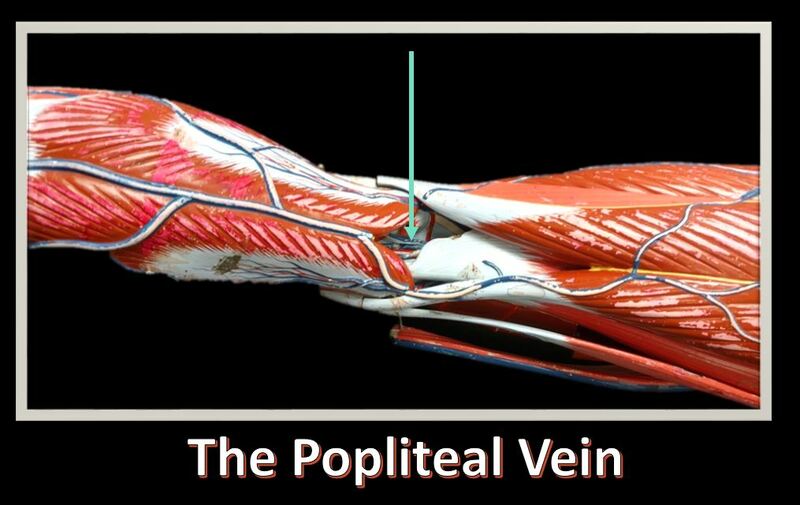 There is another vein of interest that can play a role in sending deoxygenated blood from the hand to the heart, called the medial cubital vein which branches off of the brachial vein at the antecubital region (area of the inner elbow). 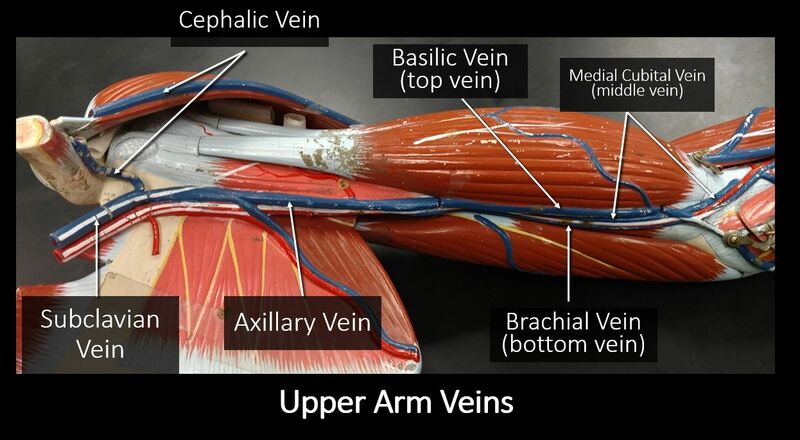 The medial cubital vein has branches that merge with the cephalic vein and the basilic vein, so that blood can essentially jump over to one of the other pathways to the subclavian vein! 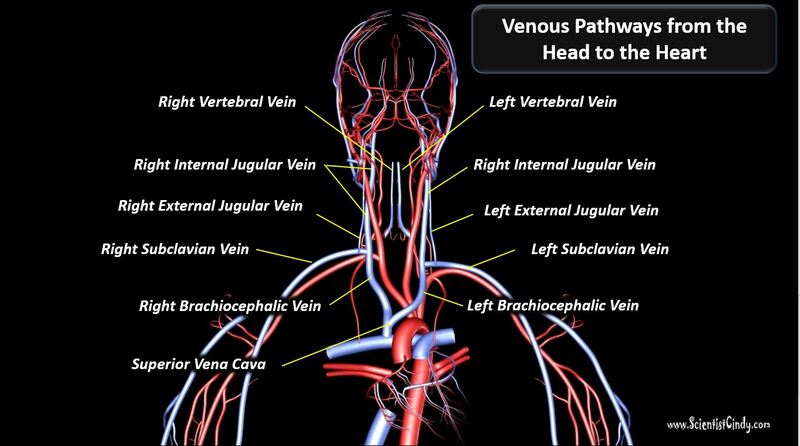 All of these pathways merge at the level of the subclavian vein located around the shoulder area. The subclavian vein turns medially and travels through the thoracic region towards the heart. The subclavian vein connects with the brachiocephalic vein which empties into the superior vena cava. 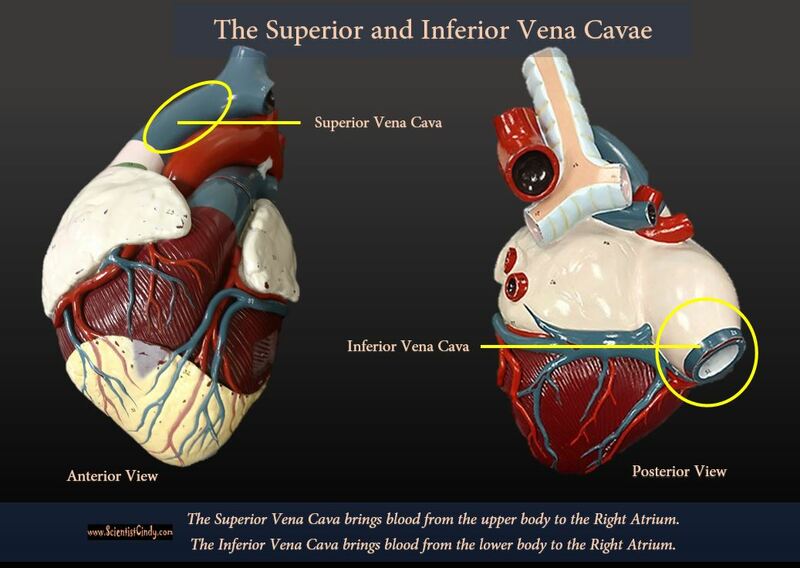 All of the deoxygenated blood coming from the upper body will enter the heart through the superior vena cava. 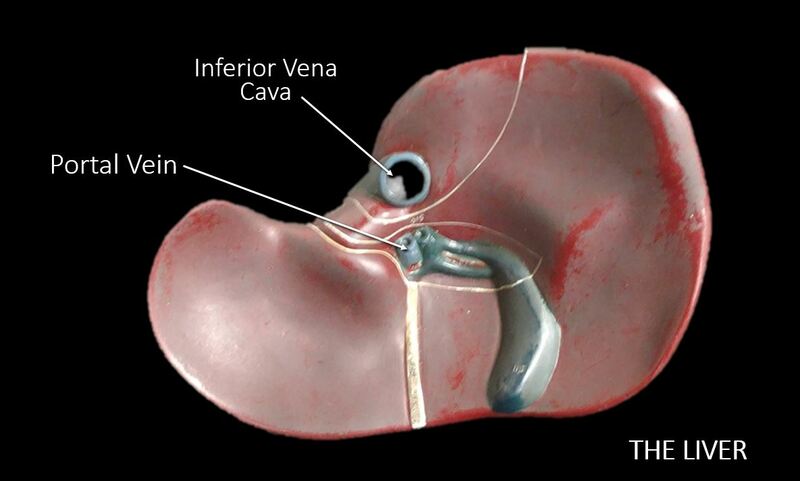 ​The superior vena cava connects directly to the right atrium of the heart. The pathways of blood to the kidneys is very straight-forward. Oxygenated blood travels from the left ventricle of the heart to the aorta. 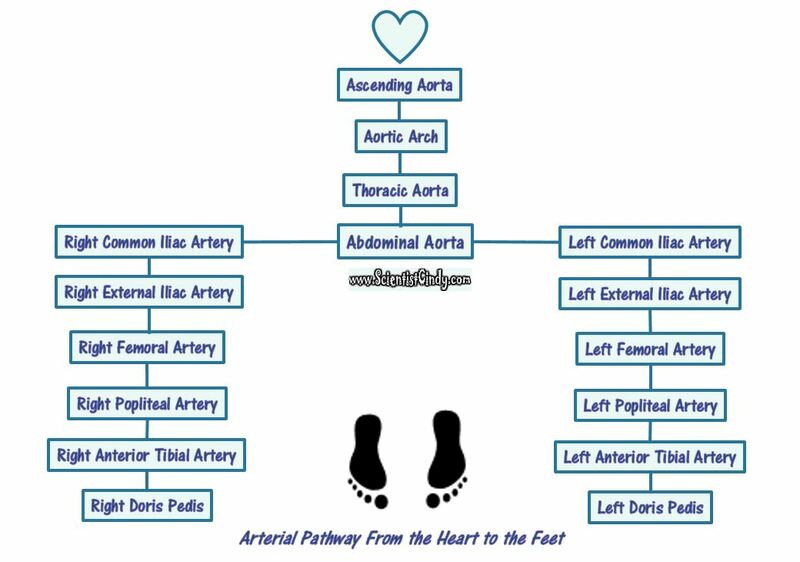 The blood travels through the ascending aorta, the aortic arch and the thoracic aorta (part of the descending aorta) and enters the abdominal aorta (part of the descending aorta). 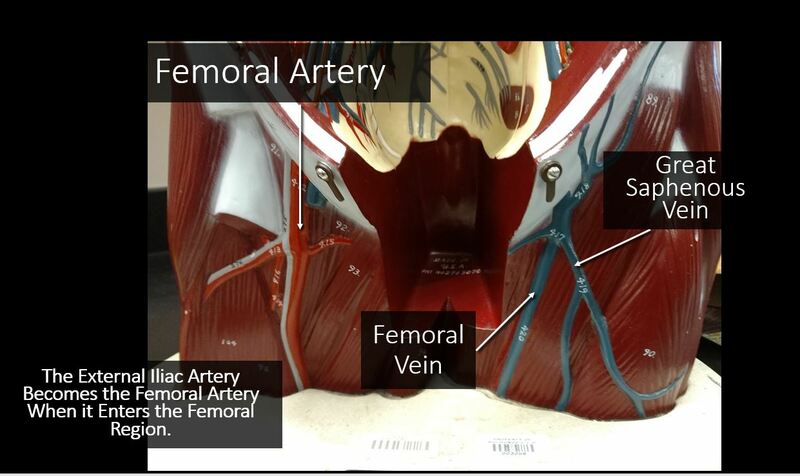 The Great Saphenous Vein branches off from the Femoral Vein and continues to travel inferiorly on the medial side of the leg.